Artist, collector, Fort Worth Circle member, and Old Jail Art Center co-founder are just a few descriptions associated with William P. “Bill” Bomar (1919–1991). Bomar was born and grew up in Fort Worth, Texas, though claimed by Albany, the hometown of his mother and extended family. His lifelong artistic passion began at the age of seven. He studied painting at the Cranbrook Art Academy (1940–41) and later individually with painters John Sloan, Hans Hoffman, and Amédée Ozenfant. Bomar lived in Texas and New York and then moved permanently to Ranchos de Taos, New Mexico. The surreal worlds manifested in his works resist depicting logic and clarity or recognizable reality. Instead they represent personal visions of a universe that are difficult to translate, but that contain familiar images that speak to the viewer in an alternative language of his own creation. The OJAC’s core collection derived from Bomar’s eclectic personal collection of American and European art. Observed closely, one can see the influence of artists he admired and collected in his own works. Often the styles of Amedeo Modigliani, Paul Klee, Arthur Dove, and John Marin—not to mention his fellow Fort Worth Circle artists—were appropriated and reinterpreted into his own artistic language. Bill Bomar first exhibited in Six Texas Painters at the Weyhe Gallery in New York in 1944. His art is in the permanent collection of the Brooklyn Museum; Dallas Museum of Art; Guggenheim Museum, New York; Harwood Museum of Art, Taos, New Mexico; Modern Art Museum of Fort Worth; Museum of Fine Arts Houston; Old Jail Art Center; and numerous private collections. The OJAC has invited Shannon Steel to guest curate this installment of Texas Moderns featuring the works of Bill Bomar. Steel’s parents, Pat and Sara, were close friends of Bomar and Shannon’s personal relationship with Bomar developed as he spent part of his summers in New Mexico visiting, observing, and working with the artist at his home and studio. 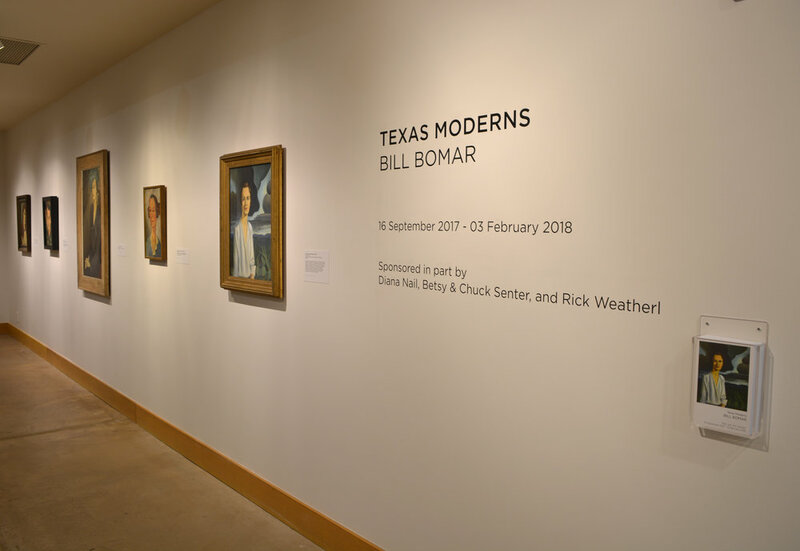 Texas Moderns: Bill Bomar is sponsored in part by Diana Nail, Betsy & Chuck Senter, and Rick Weatherl. Want to learn more about Fort Worth Circle Artists like Bill Bomar? Purchase your copy of Midcentry Modern Art In Texas today!